Global warming: climate scientists overwhelmingly agree it's real and is caused by humans. It’s pretty much this simple: Global warming is real, and our fault. A new study has just come out that looked at nearly 12,000 professional scientific journal papers about global warming, and found that—of the papers expressing a stance on global warming—97 percent endorse both the reality of global warming and the fact that humans are causing it. Ninety-seven percent. That’s what we call a “consensus”, folks. The study was clever. They found the papers by searching on the terms “global warming” and “global climate change”. Once they compiled the list of papers, they looked at the abstracts (a short summary of the results scientists put at the top of their papers) to see if the paper itself talked about the causes of global warming. About 4000 of the papers did so. That may seem like a smallish fraction, but most papers analyze measurements and climate effects, not the cause of global warming (like most astronomical papers on, say, galaxies don’t discuss how galaxies form, but focus on their structure, content, and so on—also, because there is such a strong consensus on warming, scientists don’t generally feel the need to state the obvious in their abstracts). 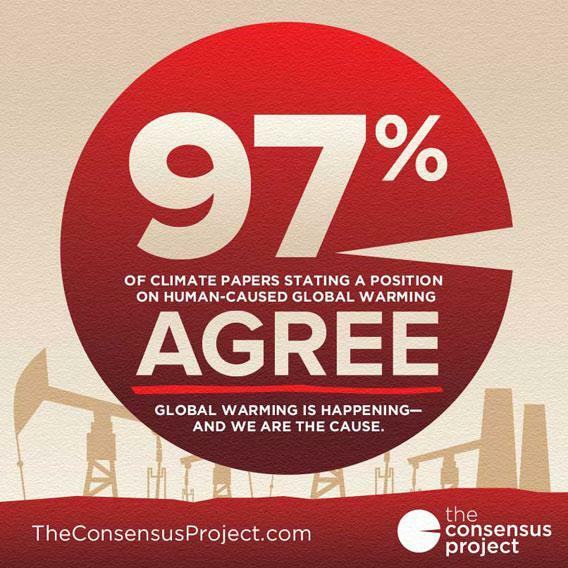 Examining those 4000 papers, the study authors determined that 97.1 percent of them endorsed the consensus that humans are causing global warming. And here’s where they did the clever bit: They contacted 8500 authors of the papers in question and asked them to self-rate those papers. They got responses from 1200 authors (a nice fraction), and, using the same criteria as the study, it turns out 97.2 percent of the authors endorse the consensus. That’s a remarkable agreement! And it’s no surprise. There have been several studies showing almost exactly the same thing. This new one is interesting due to the methodology, and the fact that it’s so robust. So, the bottom line: The vast majority of scientists who conduct climatological research and publish their results in professional journals say humans are the cause of global warming. There is essentially no controversy among actual climate scientists about this. Of course, if you read the Wall Street Journal or the contrarian blogs, you might think the controversy among scientists is bigger. But you’ll find that the vast majority of people writing those articles, or who are quoted in them, are not climatologists. You’ll also find many, including politicians so vocally denying global warming, are heavily funded by fossil fuel interests, or lead institutes funded that way. Because deniers tend to go to the OpEd pages and TV, rather than science journals, the public perception is skewed in their favor; people think this is a bigger controversy than it is. The only controversy here is a manufactured one; made up by people who are basing it on ideology, not facts, evidence, and science. That’s not just my opinion; that statement itself is backed up by facts, evidence, and science. Global warming is real. Climate change is happening. Carbon dioxide in the air is increasing, and is at a higher level than it has been for the past three million years. That carbon dioxide is increasingly heating us up: we are warming at a rate faster than in the past 11,000 years, and most likely far longer than that. And it’s our fault. It’s well past time we do something about it, and we need to get past this false controversy. For more information, go to The Consensus Project, and see what we can do about it.